War decimated earth and brought on a nuclear winter that nearly wiped out the human race. Four hundred years later, a noble but primitive civilization has developed in a land known as Chiveis. Almost everything about the “Ancients” has been forgotten, including Christianity. 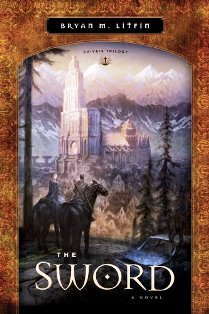 However Teofil, a young scholar and Royal Guard captain, and Anastasia, the young woman he’s rescued from Outsiders who kidnapped her and carried her to the Beyond, discovers a copy of the Ancients’ sacred writings. The narrative and poems in the book introduce a handful of Teo and Ana’s family and friends to the Good God who contrasts with the four Chiveisi gods that rule by fear and displays of power. But the High Priestess of the most potent of these gods determines to keep the religion of the cross from coming to Chiveis. I’m glad I read The Sword. I’m glad Crossway published it. I think fantasy lovers will enjoy the story. I think those who care about the Truth will question why a man with Mr. Litfin’s theological background (he’s got a masters degree from Dallas Theological Seminary and is a professor in the Theology Department at Moody Bible Institute) would write something with questionable theology. While I’d like to give this one an enthusiastic endorsement, instead I have to give it a tepid nod primarily for those who love fantasy. I think those who care about the Truth will question why a man with Mr. Litfin’s theological background (he’s got a masters degree from Dallas Theological Seminary and is a professor in the Theology Department at Moody Bible Institute) would write something with questionable theology. I’m curious if you would expand on this, Becky. This is especially because this book is something of a rarity, at least for Crossway — which, despite its track record of getting Frank Peretti started with the Darkness novels and Cooper Kids Adventure Series, does not do fiction much anymore. What questionable theology did you find? Whenever a book is set in this world, a Christian author, if he addresses spiritual things, must be faithful to Scripture. While The Sword apparently is primed to do so, Mr. Litfin took an interesting but damning turn: he had the last third of the Sacred Writings unreadable. Consequently, the characters who are learning about the Good God, do so without any knowledge of His Son. It’s an interesting twist, but the problem is the apparent relationship a number of the characters develop with the Good God, including two who die. Yet the Sacred Writings which are true and would be true in the future, too, say that the Good God’s Son is the Way, the Truth, the Life and that no man comes to His Father but through Him—the Son that these characters do not know. It’s a huge problem and one that has serious ramifications for the real world if you believe those ignorant of the Son can still come to the Father. Why then did Jesus die? Hope that explains my view. The Sword, the first book of Bryan Litfin’s Chiveis Trilogy, opens with the destruction of modern civilization by a mutant supervirus. In the chaos that follows, nuclear war breaks out and within six months most of the earth’s population is dead. For two years no food is produced, and survivors are few. Four hundred years later, the population has begun to grow again and small kingdoms have sprung up. One such kingdom is Chiveis, which lies isolated somewhere in the Swiss Alps. Its people know very little of earlier civilizations, and any study of the “Ancients” is limited to knowledge that has a practical application. Captain Teofil of the king’s guard and a farm-girl, Anastasia, are unhappy with the state religion. When they find a copy of the Bible hidden in the ruins of a monastery, they are plunged into a dangerous confrontation with the High Priestess and Astrebril, god of the dawn. The characters are just a little too perfect. Captain Teofil is a highly skilled guardsman and officer… and he’s also a brilliant scholar who knows the language the Ancients spoke. Litfin gives Teofil some insecurities, but they are unconvincing in light of his superior abilities and good looks. Anastasia is another overly idealized character. She’s drop-dead gorgeous, lethal with a crossbow, and adored wherever she goes. We get a peek into her insecurities too, but they fail to convince for the same reason as Teofil’s. The other characters are also rather wooden and predictable. There were a lot of little things that didn’t make sense. When Anastasia binds Teofil’s wound in the forest, she rips her dress to make a bandage, and Teofil notes that dresses of such fine fabric were expensive and hard to come by. So why would she be wearing it in the woods while hunting? There are problems with the writing style as well. It just isn’t very smooth, and the fight scenes especially are hard to follow and mechanically recounted. The prose is clumsy; one sentence in particular, “His eyes drifted out of the window,” gave me a mental image of two disembodied eyeballs floating out of an open window (71). “His gaze” would have been a much better choice there! One thing that Litfin did well is the portrayal of Chiveis’ culture, especially its state religion. Each of the four gods is worshiped in a distinct way, and some of the scenes with the High Priestess’ trances are chilling. I appreciated the development of the culture. It seems pretty decent at the beginning but is slowly revealed as morally decadent and lascivious. In some ways this story is reminiscent of early Christianity in the Roman Empire. The whole idea of the story is a Christian perspective on what would happen if an isolated, demon-worshiping culture like Chiveis’ discovered a Bible. Naturally there’s going to be some preachiness, and for this reason, the audience for this story is necessarily limited. As a Christian I have a fairly high tolerance level for proselytism, but I was hoping for something better written than this story was. While I found it entertaining enough while I was reading it, I probably won’t seek out the rest of the series.